The quality of light can be modified as it travels to your subject. Point light sources, like the sun on a clear day deliver extremely sharp light. Often, penetrating sharp light is changed by natural modifiers like clouds or the canopy of trees. Surfaces of objects absorb and reflect light differently. Metal surfaces can diffuse some of the light falling on it and scatter it about. Other parts of the same metal surface, depending on its texture, reflect light back into the camera lens as a hot spot. These absorbing and reflective properties of light allow’s the subject not to be seen as sculpture, but as surfaces creating tone which direct the viewers eyes to cultural details, depicting the object’s time and place in history. 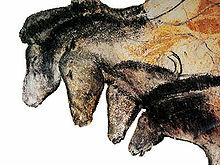 The Cave of Chauvet-Pont-d‘Arc: This cave, named by film maker Werner Herzog, “Cave of Forgotten Dreams,” revealed paintings which were 30,000 years old and holds a frieze of horses heads which his one of the most beautiful paintings in the world. Horses Head Frieze, Chauvet Cave in Southern France. Leonardo Da Vinci planned a huge equine statue, “Il Cavallo.”The 24 foot high horse was never made. It would have taken 70 tons of bronze to pour it into being. Commissioned in 1482 by Lodovico Sforza, duke of Milan, in honor of his father Francesco, the massive bronze horse took Leonardo 17 years of research, but was never completed. When the full-scale clay model was finally ready to be cast in a single operation in 1499, all the needed bronze was used to make cannons for an imminent war against the King of France. The molds were lost and the clay model was reduced to rubble by the invading French soldiers. 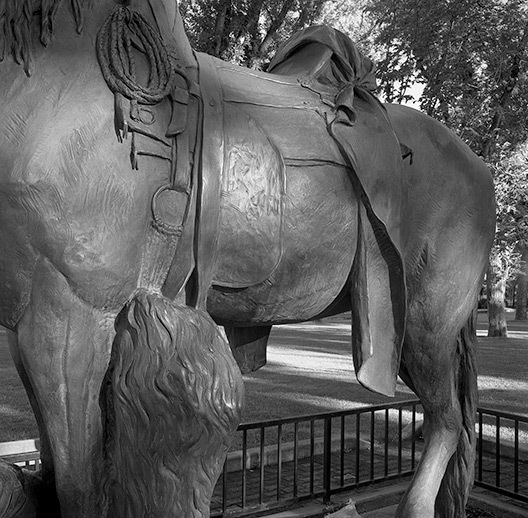 The etched bronze textural surfaces of rope and saddle standing now in ”Prescott Square,” Arizona, is an artifact of western history, asking if we care to remember the sacrifices of men with metal.